I was notified by a colleague on my way to airport to BKK last wed…. And this is what I got from searching..
Just like the way he planned the proposal. Christopher described how he went on bended knee to ask Fann on the second day of Chinese New Year, in front of some 20 people, including her family and their friends. She said yes – of course. The actor enlisted the help of good friend David Gan to get the perfect ring – a $50,000 two-carat solitaire with tiny diamonds around its platinum band. NO, they aren’t sure when they will marry. 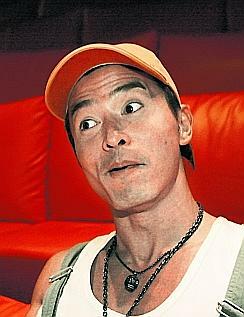 But Fann Wong and Christopher Lee are sure it will not be a shotgun wedding. Pregnancy rumours had surfaced recently, after a supposed sighting of the actress ordering milk in a French restaurant. Speaking to The New Paper on Wednesday, the slender Fann laughed and said she has been teased mercilessly by her co-workers while filming a Channel 8 drama. ‘Actually my baby has already been born and we’re throwing a first-month party for it in Studio 6,’ she added mischievously. She is referring to the MediaCorp studio where she will be filming indoor scenes from next month. She plays a mentally disturbed career woman, opposite Pierre Png. Of course, a few more years can make a difference, but never mind. Marriage, she said, ‘is an important phase in life, so we must plan it well and not be too casual’. While she finds shotgun weddings acceptable, ‘it doesn’t mean I’m going to practise it’. When asked about shotgun weddings at a separate media conference yesterday, Christopher, 37, burst out laughing. He said: ‘You might as well kill me! ‘We won’t let it happen. It’s not that I can’t accept the idea – at this age, even if you get pregnant first and then get married, it’s still a joyous occasion. It’s a matter of your maturity level. Yet, Fann’s hands were conspicuously bare when she met the local media on Wednesday to promote her new film Dance Of The Dragon. Why wasn’t she wearing the ring? We couldn’t get Fann to comment by press time. But David, who said he’s only seen Fann wearing her engagement ring once at a dinner recently, reckons she keeps it hidden when she’s at work. ‘She’s probably keeping it in her Hermes bag,’ the celebrity hairstylist told The New Paper. ‘Or she dare not wear it because the one I’m going to give her is much bigger,’ he added in jest. David, who dabbles in jewellery design, said he bought two four-carat heart-shaped rings in 2001. He gave one to Caldecott queen Zoe Tay when she got married, and he has been keeping the other for Fann’s big day. He also intends to buy Fann a diamond tiara for her wedding. When Christopher approached David for help to pick out a few diamond rings late last year, the latter decided to draw three or four designs himself, with Fann’s ‘very small hands’ in mind. The rings were then made by a jeweller in Barcelona. Showing the finished products to Christopher, David said he was ‘quite surprised’ when the actor picked the most expensive ring. David said Christopher intends to buy ‘another bigger diamond’ for their wedding. Earlier reports had speculated that the couple had picked 28 Dec for their big day, but both Fann and Christopher denied this. Christopher said they had not started to plan yet. And it would be Fann’s elder sister’s wedding on 28 Dec.
Once the decision is made though, the couple promised they would announce it to the public. But when this reporter suggested that Fann hold a press conference, she blushed and fanned her face. Fann had revealed, in the latest edition of Her World magazine, that Christopher had proposed and she had accepted. ‘It was quite romantic,’ she added, without giving details. Christopher, however, was glowing with joy when asked how he popped the question. While he prepared the ring with David’s help, he was unable to find a bouquet of flowers to complete the romantic picture. ‘Without her knowing, my friends and I were looking for flowers all over Singapore, but not one (florist) was open (during the festive period),’ he lamented. Still, he got down on one knee and proposed to Fann during a big gathering at a friend’s house, with Fann’s family members also present. That is greeting in Thai language..
“My very first lunch in Bangkok which consist of a plate of healthy “Som Tum”,which is papaya salad and a delectable bowl of Pork noodles,done in the same fashion like beef noodles in singapore. I think the best som tum is from ‘Ortokor” market right across chak tuk chak…and i think ortokor market is absolutely amazing.However, since this time i did not manage to stay for the weekend, som tum anywhere would do…. Chicken Rice…some say that only in Singapore that you find the most amazing Chicken rice..however, i beg to differ.. This chicken rice stall sits in a cramped up little spot just in front of Burger King along Silom road (Saladeang) only after ten pm in the evenings. This is my staple food in BKK(bangkok)..I wouldn’t feel that i am really in bkk if i did not have my usual two servings of this chicken rice..why two you might question..simple..first of all it is too delicious to be true, secondly,the servings are pretty small and most importantly,好事成双!!! I might be biased though,as i have patronised this stall for many years and they have never ever let me down..You can choose to have it uncuthmm,i mean ..with the skin or without the skin..hmm..anyway, the chilli ..aroy MAK!!!! On this trip i discovered another delicious stall that i would now add to my list of food that i die die have to eat while i am in BKK. Just along the same stretch of road, barely three metres away, is a “Kway Chup” stall that’s been there for donkey years whose presence has never been acknowledged by yours sincerely by however, this trip i am feeling rather porky and after whooping down two plates of chicken rice, i decided to have a bowl of kway chup and it ended up looking like this…..
“Health Land” is where you should go to be strong and healthy! Nestled away along the famous atas “Sathorn” road, this is the place to rest your ravaged body! Happy us with our yummy mango! Do you know what your chinese name means?? 5 of us girls went to Mellben Crab feast, followed by mahjong and wii game at Jenny’s place..
Photo-taking while they are engrossed in their Wii game..
Yeah.. that is one of the dishes I learnt from my housemate..
Firstly, you need (1) potato – cut them into small cubes and fried them..